Standing before a crowd of aspiring writers some twenty-five years ago, Hugo and Nebula award-winning author Scott Card admonished, “Nobody ever woke up and decided ‘today I’m going to be evil’.” Outstanding advice, as crime fiction only resonates when there is a believable villain. No matter how twisted or diabolical, there must be plausible logic behind the bad guy’s exploits. And that is what we have here, a slick, highly realistic, and impeccably crafted thriller. Likeable characters, outstanding pacing, and unexpected plot twists that keep readers guessing throughout. Someone has been kidnapping, torturing, murdering, and mutilating women in Paris and it is Nico Sirsky’s responsibility to catch this demented predator. Brilliant, intuitive, and wholeheartedly obsessed with his job, Nico is the youngest ever commander of La Crim, the Paris Criminal Investigation Division. This rapid rise through the ranks comes with a downside—horrific cases tainting his view of humanity, insufficient sleep, questionable nutrition, and an unfortunate divorce combined with monumental job stress are affecting his health. After suffering with a persistent stomachache for three months he finally makes time to see gastroenterologist Dr. Caroline Dalry and is struck by her beauty. Shortly thereafter they begin to date. Meanwhile a killer has struck. Early in the investigation Nico finds a message scribbled in blood on the first victim’s mirror, “Seven days, seven women.” Thus begins a race to stop the slaughter before it’s too late. As bodies begin piling up, it appears that the killer is targeting victims close the lead investigator, taunting “Can’t you even protect your women, Nico? I am God. You are nothing.” The juxtaposition between the revulsion one feels from descriptions of the book’s horrific crimes and the titillation one experiences from the burgeoning romance between Nico and Caroline whipsaws readers’ emotions, leaving a lasting impression long after the story has concluded. 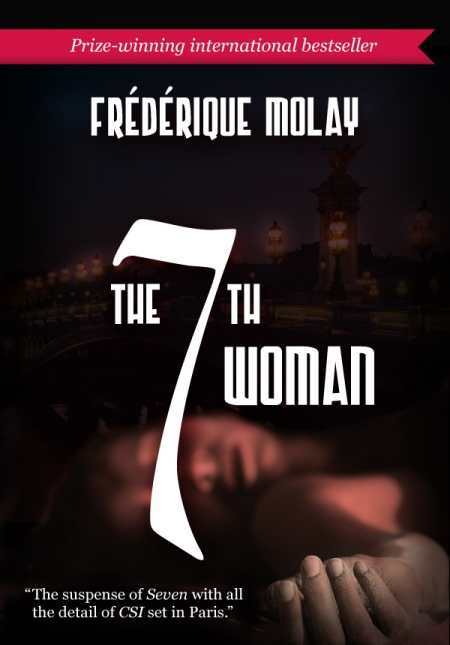 Winner of the 2007 Prix du Quai des Orfèvres for best crime fiction novel of the year, Frédérique Molay has written five books, with three in the Chief Inspector Nico Sirsky series. She graduated from Science Po and began her career in politics, working as Chief of Staff for the Deputy Mayor of Saint-Germain-en-Laye before being elected to the local government in Saône-et-Loire. Spending nights pursuing a passion for writing, she became a full-time novelist after The 7th Woman turn out to be a tremendous hit in France and subsequently an international bestseller. After twenty-six years working in translation, publishing, and communications, Anne Trager founded Le French Book to translate books into English. The company’s motto is “If we love it, we translate it,” and Trager loves crime fiction. Molay and Trager have teamed up to produce an extraordinary, hard-hitting novel.